(Hurt2HealingMag.com) Social media has become the driving force for disseminating information as well as social engagement, yet there are many who still find it quite intimidating or without significant value. 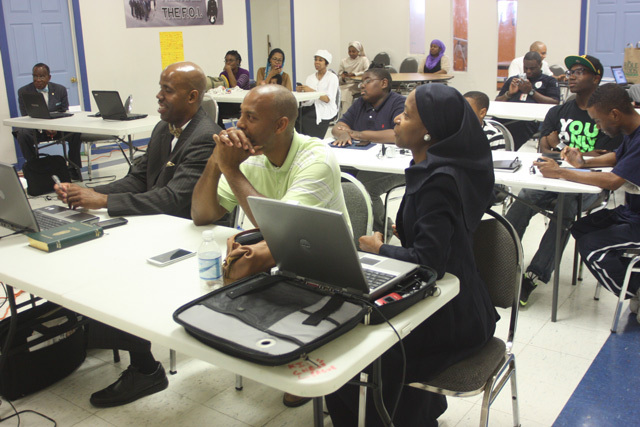 On June 1, 2013 those apprehensions were met with a powerful, engaging and inspiring presentation during the Houston Tweet Up and Social Media Workshop led by Brother Jesse Muhammad, at Muhammad Mosque No. 45 in Southeast Houston. This would be his third official presentation subsequent to New Orleans, LA and Austin, TX. Brother Jesse is an international motivational speaker, award winning blogger, social media expert and Staff Writer for The Final Call Newspaper. Along with managing his own personal Twitter, Facebook and Instagram accounts, Brother Jesse also manages the official social media accounts for the Honorable Minister Louis Farrakhan, National Representative of the Honorable Elijah Muhammad, the Leader of the Nation of Islam. Brother Jesse began his presentation by showing the attendees the music video, “Raise Your Flag Up”, by Hip Hop artist Jasiri X. The audience’s attention was immediately drawn in to the lyrics and imagery of the film, which was a wonderful segway into the social media workshop. The next slide was an image taken from the late 1980’s movie, “I’m Gonna Get You Sucka”, where Antonio Vargas’ character was released from prison after serving a significant amount of years, which as a result caused him to lose touch with current fashion trends. If you can recall the gold bell bottoms with the fish tank platforms, then you understand how out of touch he was with what was considered in style or modern. This was the correlation Brother Jesse was making regarding how many people still operate in the world today; with an old mindset. There are modern means of communication and interaction that many have yet to use, because they are still holding on to ideas and methods that are outdated. He continued by sharing the story of how he was asked to set up the official Twitter account for the Hon. Minister Louis Farrakhan. According to Brother Jesse, the Minister was initially apprehensive to engage in social media until he learned of its immense benefits and ability to reach millions all over the world with the Word of God. After Brother Jesse introduced Minister Farrakhan to the mechanics of Twitter and the various ways he could use the network, the rest was history. Brother Jesse explained to the audience why they were needed on the “Digital Battlefield”.